The 'Star' series was bred to have upward facing flowers; it is similar to the Mckana varieties but in single colours. With crimson red sepals and creamy white centres, the blooms have elegant long spurs and tidy mounds of fern like foliage. This bright red columbine looks equally wonderful in the middle of a sunny, herbaceous border or to light up a dark corner of the garden. A popular and easy-to-grow plant, it is happiest in soil that does not dry out in summer. Also available in White Star and Blue Star, this early summer Cottage Garden favourite produces striking, long spurred blooms year after year and will flower all summer if dead-headed. A superb and reliable Aquilegia variety that makes an ideal cut flower and herbaceous border feature. Seeds can either be sown directly where they are to flower or can be sown into pots and grown on, before transplanting. Avoid the hottest and coldest parts of the year and sow in early spring to early summer or sow in autumn. Find a cooler part of the garden that enjoys dappled shade. If you have plenty of seed start by sprinkling seeds straight onto the ground in late-summer. Rake so that the seeds are covered with a small amount of soil. The seeds will germinate by the following spring. Aquilegias will self-sow into choice plants, so only sprinkle the seeds where it will not matter. Sow seed on the surface of lightly firmed, seed compost in pots or trays. Cover seed with a light sprinkling of vermiculite. Stand the pot in water until the soil is moist and drain. Either use a plastic lid or seal container inside a polythene bag to keep the moisture in. Keep at 15 to 20°C (59 to 68°F). After sowing, do not exclude light as this helps germination. Keep the surface of the compost moist but not waterlogged. Always stand the pots in water: never water on the top of seeds. Expect germination within 2 to 3 weeks. Overwinter September sowings in a cold frame and plant out the following spring. When large enough to handle, transplant seedlings into 7.5cm (3in) pots or trays. Gradually acclimatise to outdoor conditions for 10 to 15 days before planting out after all risk of frost, 30cm (12in) apart. Feeding is unnecessary unless the soil is exceptionally poor. An aquilegia should not need staking, but an overfed plant will flop. Their rounded foliage is attractive, even in winter, but it looks much more impressive when given a late-autumn haircut. Cut the leaves right back and fresh foliage will appear. When the flowers are finished, around the end of June, cut the stalks off and let the leaves do their stuff without the distraction of drying spikes of stem. Lift and divide large clumps in early spring and apply a generous 5 to 7cm (2 to 3in) mulch of well-rotted manure or garden compost around the plant. Divided specimens may take some time to establish since they don’t like having their roots disturbed. Contact with the sap may cause skin irritation. Columbines tend to cross-pollinate, hybridise, and self seed freely, creating new strains and colours. The formation of seeds will shorten the productive lifespan of the plant, so it is best to remove the spent flowers promptly. 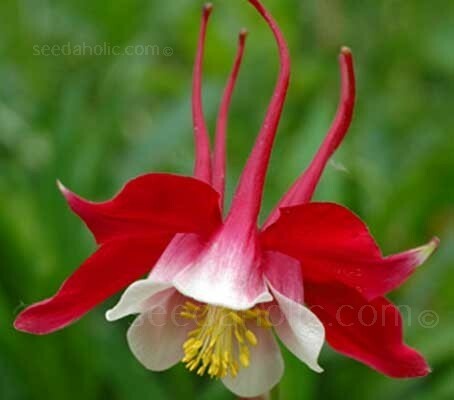 Columbines tend to lose vitality after 4 to 5 years and are best replaced at that time. Cottage/Informal Garden, Borders and Beds. Shade Gardens. Columbines in the wild are identified by species characteristics and often are endemic to a specific geographic area. There are at least seventy species of Aquilegia, including Britain’s native Aquilegia vulgaris. Aquilegia vulgaris has been grown in gardens since the 13th century, when it first appears in illuminated manuscripts. Columbines (even those in the wild) will hybridise easily between species, many of those bought in nurseries are cultivars and are bred and sold for their showy blooms and hardiness. Long-spurred hybrids are derived from crosses with A. caerulea, (coerulea.) introduced into British gardens from the Rocky Mountains in the 1860s, and hybrids with A. chrysantha from Arizona have widened the range of colours available. The genus name Aquilegia comes from the Latin word aquil meaning eagle, in reference to the flower’s five spurs at the back of the flower that resemble an eagle’s talon. The species name vulgaris simply means 'common', the most common form of the plant. The common name, columbine, comes from the Latin columbinus, meaning 'dove-like'. If you up-end an aquilegia to reveal the spurs, they resemble birds feeding and 'Doves round a Dish', another common name, reflects this perfectly. The flower was often depicted in medieval paintings to represent the dove of peace. The family name Ranunculus is a diminutive form of the Latin rana meaning 'little frog'; because many of its members grow in moist places. Sow February to June or September to October.